The World Economic Forum (WEF) have released their global competitiveness report. 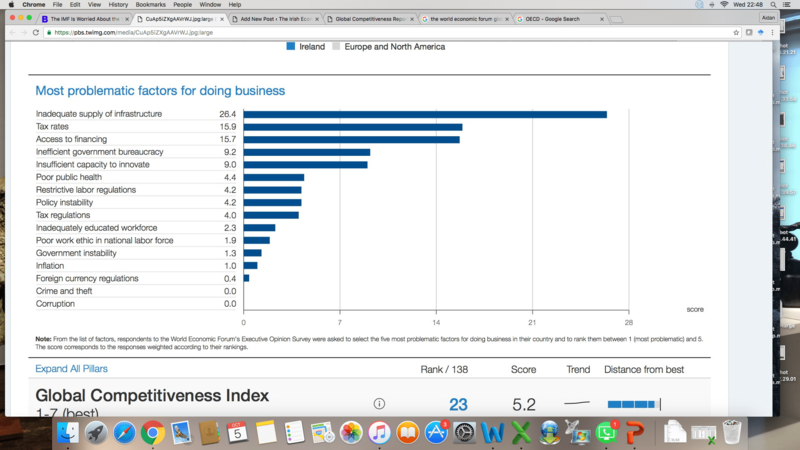 Ireland ranked 23rd, which was one of the lowest in Western Europe. Eleven other countries in Western Europe were ranked higher: Switzerland, Germany, Netherlands, Finland, Sweden, UK, Norway, Denmark, Belgium, France and Austria. Inadequate supply of infrastructure was identified as by far the biggest deficiency, and the most problematic factor for doing business. In light of the upcoming budget it’s probably worth noting that all European countries who scored better than Ireland have a higher tax to GDP ratio. Revenue as a percentage of national income is higher in all these countries, which can be probably be taken as a measure of state capacity. The full report can be read here, and the full listings here. Interesting stuff, but I am a bit wary of international rankings generally (a lesson learned when looking at university rankings). You pick on deficient infrastructure as a problem. OK, but the next biggest bugbear for those surveyed was high tax rates (surprise, surprise, when you survey senior businesspeople). So if these clever people are asked if they would favour higher taxes to fund better infrastructure, what would be the answer? You comment that “all European countries who scored better than Ireland have a higher tax to GDP ratio”. I should have thought that, post the 2015 GDP revisions, this particular ratio was even more misleading than ever for Ireland. What about taxes as a % of Net National Income, which as far as corporate taxes go would be consistent as these taxes are levied on profits net of depreciation). I was hoping someone would raise these points! Thanks. Yes, I agree, surveying very well endowed income earners (who are also, most likely, capital asset holders) is highly problematic. And it is unsurprising they want to pay less tax. I seriously doubt these people recognise the relationship between poor infrastructure and weak state capacity (measured by the ability of the state to raise high levels of revenue as a percent of national income, and to invest it efficiently). However, I imagine this category of income/capital earners would happily pay water charges, and other indirect measures of revenue raising capacity. But I think the massive infrastructure problem in Ireland (and I include exceptionally poor quality housing in this) is structural, and unlikely to be solved via raising revenue. It requires the state to borrow and invest. Ireland missed the post-war thirty year period of strong growth and strong investment (call it coordinated capitalism, or state-directed capitalism) and we’ve never really caught up with Western Europe in terms of infrastructure. As a Swedish sales executive said to me at the weekend, “when my Grandfather visited Ireland he said it reminded him of Sweden fifty years ago”. There’s a glint of optimism in that statement. But do we have 50 years? I also agree that taxes as a percent of national income would be a far better measure than taxation as a percent of GDP. I imagine this would push Ireland closer to say, Switzerland and the UK. But this gets back to the point about whether the state should tax or borrow to fill the infrastructural deficit. Ireland could increase revenue by a third and it would never get close to Swiss levels of public infrastructure. If state borrowing for investment means breaking the EU rules (on debt to GDP ratios), well, so be it. The productivity gains will be worth it, in the medium to long run. All of this still begs the question as to whether the Irish state is capable of making strategic investments in infrastructure (and at a reasonable cost). This is a debate worth having. State capacity is not just related to the ability to raise revenue and make strategic investments (and thereby generate social solidarity/trust for higher levels of taxation). It requires a benevolent social-technocratic approach to economic coordination. Ideologically, Ireland is not in that space. So the political underpinnings that are necessary to generate a social-technocratic (or Western European) approach to capitalist development are difficult to see right now. Many thanks for highlighting these latest rankings – though I’m not too sure about your screenshot, because the download of the Ireland country report suggests that access to financing is seen as the biggest problem with inadequate supply of infrastructure coming down the list. Interestingly, the listing of obstacles – as perceived by businesses – is quite similar in Ireland and Britain. The principal difference is that British businesses are grumbling more about an inadequately educated workforce. She is quite correct in asserting that the greedy and self-serving antics of these reprobates have aroused public disgust and anger in Britain. And it will be interesting to observe what remedies she will propose and implement. It would not be difficult to come with a slightly different list of “Nine Nasties” in Ireland, but one thing we can be absolutely sure of is that no Irish governing (or opposition) politician would list them and commit to tackling them. “Brexitian”. Patent it, if its yours. Great point re the exodus. It looks like the Jewish expulsions from Spain in 1492 that ultimately doomed the Spanish empire. Except the UK starts off from a much weaker position. Brexit is simply incoherent. Ireland was at 11 in the WEF rankings in 2001 — just ahead of the UK, Hong Kong, Denmark & Switzerland — and in coming years there should be some improvements when debt and other economic indicators improve further. This year Ireland is just ahead of Saudi Arabia. The 12th pillar innovation is at 21, which is a lot more realistic than an INSEAD/Cornel/WIPO Global Innovation rankings which has Ireland amongst the top 10. Poor adult skills, including non-grad younger people, and training services, are also deficiencies that get little attention. On infrastructure, public project management has traditionally been poor, partly reflecting the system of local politics. The Dublin-Naas dual carriageway was opened in 1962 and 48 years later the motorway to Cork was completed and the National Roads Authority (NRA) with the imprimatur of politicians originally decided that there was no need for motorway services — drive off the to nearest town for a pee! The NRA said in 2005 that land acquisition took 23% of the national road building budget compared with 10% in Denmark and 12% across then EU. Having read many public reports over 20 years, it’s strikingly rare to see old fashioned SWOT analysis. A few years ago a report on the revival of manufacturing contained the words ‘strengthen’ or ‘strength’49 times but no ‘weak’ or ‘weaknesses’! This is the age of spin! There can be little hope of any improvement as long as the budgetary debate is about “extra” leeway for spending and focused on the balance to be struck between “the provision of services” and “tax cuts”. Both electorate – especially the public sector – and politicians like it that way. Only under EU pressure has there been any concentration on the fundamental issue; the balance to be struck between consumption and investment. The only development that will change this is a change in the structure of the workforce and a resultant move of the balance of power from the non-traded to the traded sector (especially for those in the latter group who have nothing – literally – approaching the job security and pension entitlements of most of those in the former). There are some signs that this is happening; largely because of the limitations posed by the EU budgetary rules placing an overall limitation on the further burdening the economy as a whole with debt. Each time it has happened, investment has collapsed. The present example is simply the worst of an historical series. Aidan, thanks for posting this. Where did you get the report you’ve screenshot-ed? I can get a similar report for Ireland, but not the one you’ve posted. I got it directly from the WEF site yesterday (via twitter). If you go directly here, and then select country profiles, it will bring you directly to the screen shot I took. Using the most recent (2014) OECD data available for all countries, Ireland has a noticeably average G over GNI: nestling in between Norway and the UK (who are both more competitive on this index, but lower in government spending per GNI), and Spain and the Czechs (who are both less competitive, but higher in government spending). The Exchequer spent €7bn servicing the national debt in 2015, or about €85,000 for every man, woman, and child in Croke Park last weekend. As a nation, we’re doing this every year. Would paying down debt be a reasonable investment for future generations? To quote Upton Sinclair; “it is difficult to get a man to understand something when his salary depends on his not understanding it”. The men, and women, involved, regrettably in the Irish, and parallel situations such as Greece, are the best educated and most capable of grasping the point at issue. They have absolutely no intention of doing so. I’ve done this in a bit of a rush, so not claiming that it is 100% reliable, but when I look at the tax take in Ireland versus NNI instead of GDP we are quite a good bit closer to the European mainstream. We come in 18th out of the 26 for which data come to hand instead of 24th out of 26. The gap with the EU-28 as a whole drops from 9.5 percentage points to 5.4. Big countries in western Europe less heavily taxed than Ireland are the UK and Spain. It would be interesting to do the same calculations across a few other macro benchmarks. I’m not at all sure that it’s feasible to close the gap with the EU average. If the number 1 competitiveness issue coming out of the WEF research is infrastructure, the number 2 is taxation. I’m fairly sure that primarily means taxes on the incomes of middle and high earners, with a side-order of fairly stiff taxes on inheritances and capital gains. If we go looking for lessons from Europe about other sources of tax income, and we limit ourselves to sources that will not evaporate or strangle important economic activity in response, we are really looking at taxes on low incomes. Which is a non-starter politically, and which would – at least in the short run – bring our fairly respectable post-tax-and-transfers Gini coefficient more in line with the horror story of our pre-tax Gini. I’m sceptical about stealth taxes on water and the like being a real solution. They may have tactical advantages, but they are generally regressive in ways that make our extreme pre-tax-and-transfers inequality even worse, and the way the system as a whole responds to this seems to me to be highly dysfunctional. I personally favour trying to drive the elevated regulated and quasi-regulated prices in the economy down so as to make it possible to unwind our complex system of implicit and explicit subsidies, and compensating measures. It seems to me that if we can do this we stand a better chance of making the price of infrastructure affordable. @BeeCeeTee: You refer to “stealth taxes on water”. What we have now for households, almost uniquely in Europe, is 100% stealth subsidies on water. So water charges should not figure in any proper discussion of broadening the tax base, rather on narrowing the scope of subsidies which break the link between costs and prices..
What about property taxes? The real cowardice and blindness of politicians (and other who should know better) is putting this modest attempt to broaden the tax base in jeopardy. These, broadly, represent the most influential sections of Irish society. Nothing much could be done about them when the IMF were in town. I think docm has hit the nail on the head above – basically if there is a powerful lobby group involved, just forget it. Ireland missed out on the infrastructure boom of the 30 glorieuses post 1945. But at lot of that infrastructure is very shabby now. It also drew in a lot of immigrants eg France and its Algerians or Germany and its Turks. The Euro is an ok place to be as long as you control your financial sector. The currency is undervalued. Ireland could do quite well out of the next 20 years if it is managed coherently. But that would be a first. The land rezoning system that makes development land scarce in a low population density country remains intact. Ownership of land near significant urban centres in terms of risk remains the best route to riches in Ireland despite the long investigation of planning corruption. The PAC said public bodies are the largest procurers of legal services in the State with an estimated spend of anything up to €500m. The feeble legal services reform that was enacted in the closing months of the last government had a significant input from the lawyer vested interests. 1) Funding of current public health expenditure at 20% of current government expenditure in 2014 was the highest in the EU28 and compared with 13.6% in Sweden; 14.3% in Finland and 16.3% in Denmark. Total spending at 12.4% of GNI was second highest to the US in the OECD area, with poor outcomes in several sectors. 2) There are as many directly employed in food /during production as in drugs medical/devices but the former has a much greater linkage impact. 3) Typically Irish agricultural land prices are 4 times the level of arable land in France where the entry of young people to agriculture has been promoted for 50 years. Because of the low turnover of land, Irish land prices are among the highest in the world — not goods news for the critical indigenous sector. The beef sector depends on EU subsidies. 4) Economists should recognise that there are two distinct economies in Ireland. The significant non-exporting private sector is one of low pay; very low occupational pension coverage; poor adult skills, and one of the highest percentage of jobless households in the EU. Italy after almost 2 decades of stagnation is still ahead in a proxy for individual standar of living. And we want joined up long-term planning? Brian, in light of the central bank’s credit restrictions many developers (who have such good judgement that they literally laughed at the idea the CBI might do such a thing without being made to back-down by the politicians) now consider they have paid a little too much for sites and land. A boost to purchasing power will bail them out – perhaps enough to make them enthusiastic. Having them crystallize only a modest profit, or perhaps even a loss, through a meaningful site value tax – and hand proceedings over to players with less likely to overpay for land – would not be a likely Irish solution. The most interesting thing about the current budget debate is that it is both the same as usual – in terms of the quality of the political debate, it reflecting uncomfortable aspects of Irish society – and somehow very different. The difference lies in three essential elements (i) lack of an automatic government majority (ii) an actual debate on priorities, if not the right ones (iii) externally dictated expenditure ceilings, this element being the most significant. By and large, all very positive developments. This comment by Conor Brady in today’s Sunday Times is worthy of being recorded. “Whatever about making the budget “Brexit-proof”, as promised by the taoiseach and the public expenditure minister, Paschal Donohoe, it is difficult to make it “Paddy-proof”. Not PC, of course, but very hard to dispute. On Brexit, maybe Hanrahan is wrong in any case, at least in relation to the issue of free movement. It will eventually register, with both commentariat and electorate, that border trading exchanges are small beer in the wider Brexit/Continental context. The number of U-turns by what passes for a UK government is, at this stage, almost in double figures. This is the only issue on which a U-turn seems politically impossible; at least until what has been described – aptly – by the head of HSBC department concerned, as the “official UK opposition” , aka the currency markets, decides otherwise. Assuming that a U-turn on the issue of quitting the Customs Union is also on the cards, the North-South administrative problem would be reduced to dealing with the issue of differing regimes for agriculture and fisheries. The economic issue would, however, remain, notably the possibility of Sterling at near parity with the euro, effectively a substantial devaluation relative to the Punt. And a domestic industry, as MH never ceases to point out, incapable of competing, largely because of cost burdens imposed by a plethora of domestic vested interests; which brings us back to the comment by Conor Brady.